Hatchback who had another name of this Demio, look cool with the embedding doublemuffler on the back. This car has the advantage, among others are more modern design, high-quality, resilient and sure-engine fuel efficiency. In terms of interior, the Mazda2 has the luxury sedan at a premium. Seen from the indicators, controls the dashboard and steering wheel swich instruments. Differences exist only in the seat upholstery material is lighter beige color. For audio, it has been equipped with features ALC (Automatic Level Control) which can adjust the volume level of cabin noise. Not only that, given Mazda2 leg room for front and rear passengers are also quite relieved. 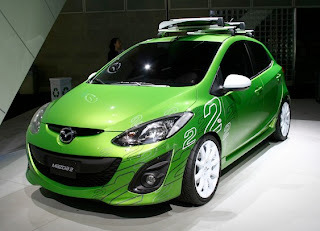 Mazda2 equipped with a capacity 1.5-liter 4-cylinder, DOHC 16-valve power-producing 103 hp at 6,000 rpm and 137 Nm of torque at 4,000 rpm. Mazda2 Claimed fuel consumption is recorded out of town 17.8 km / liter, in the city of 11.23 km / liter and a combination of 14.7 km / liter. About the price, very competitive Mazda2 Sedan. For type S / T released Rp 220 million. While the type S A / T Rp 230 million. While the Mazda2 Sedan RM / T priced at Rp 236.5 million and type RA / T Rp 245 million.